Debut album from these US Metallers, featuring Trevor William Church, son of Montrose / Sammy Hagar solo bassist Bill "The Electric" Church. Hailing from the United States, HAUNT began as the work of modern renaissance man Trevor William Church. Son of Montrose / Sammy Hagar solo bassist Bill "The Electric" Church, the California native came to prominence as the vocalist/guitarist of doom-lords Beastmaker, who've released two critically acclaimed albums on Rise Above. 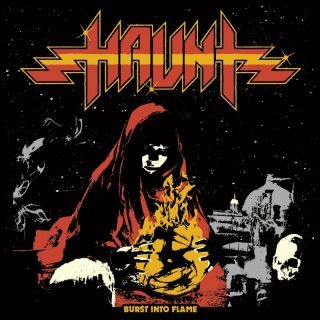 However, as HAUNT, Church went solo and created a bewitching brew of classic, turn-of-the-'80s heavy metal, drawing deeply from the momentous NWOBHM movement. From the hard-charging opening title track on down to the dramatic, climactic closer "Looking Glass," HAUNT's first long-playing attack ably displays all the arsenal at their disposal. And they make great use of it across the nine anthems comprising Burst Into Flame's tighter-than-tight 38 minutes; indeed, each of the album's nine component tracks could be a "hit" in and of itself. With HAUNT now a full band and steady gigging across the country already commencing, their trajectory is onward and upward and, most likely, beyond. "No one can take me off my throne," Church sings on album's title track, and more prescient words have never been spoken: HAUNT have arrived as kings. Are you ready to Burst Into Flame?